Founded in 1958, Gautier is based in the West of France with three production sites and over 850 employees. The Gautier Group is recognised in the market as a contemporary furniture manufacturer, and carries out 95% of its production in France! This family business has successfully navigated the bumps along the road and is still growing! In 2005, Gautier turned the French furniture market on its head by creating its own network of stores. Gautier’s network of stores in France is one of the most concentrated in Europe. Today, the network has 80 Gautier stores in France and around the world (over 40 international stores)! Gautier is developing well both in France and worldwide, thanks in part to a family passion for entrepreneurship and new challenges! Gautier has built its strong reputation on the quality of its products. Its culture springs from its expertise in kids' bedrooms. 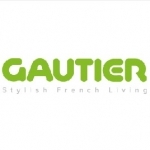 Today, Gautier is a leading European contemporary furniture manufacturer and an ambassador of “Stylish French Living”. It has made a name for itself thanks to the style and character of the furniture designed by its passionate teams and manufactured in France. Gautier, a socially aware and committed company, places furniture eco-design at the heart of its process. Creativity and quality have even more meaning when a company is committed... and sustainable! The Gautier home furniture range covers the entire spectrum of living spaces: Living & Dining collections (including sofas), Adults' & Kids' Bedrooms, wardrobes systems and other home accessories like curtains, rugs... But Gautier's service does not mean only selling furniture; it also offers great interior design advice for your home!